This comes from a new World Rainforest Movement briefing titled “FSC certification of tree plantations needs to be stopped“. The briefing is timed to coincide with the FSC’s General Assembly, which will take place from 3-7 November 2008 in South Africa. Despite the fact that FSC has been carrying out a “Plantations Review” for the past four years, FSC continues to certify some of the most destructive plantation operations in the world. 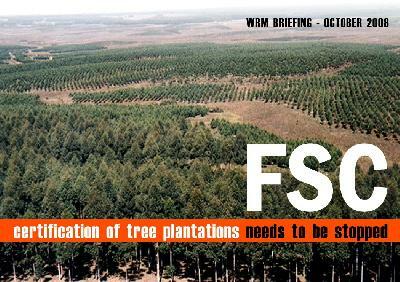 In an attempt to change this, a number of organizations from countries impacted by FSC-certified plantations have written an open letter to FSC members. If you wish to support local communities struggling against tree plantations, please sign on to the letter by filling out the form on WRM’s website or by sending an email to support@wrm.org.uy, before 31 October 2008. FSC members -particularly from the environmental and social chambers- must be made aware that certification of that type of plantation is not only eroding the FSC’s credibility but -more importantly- that it is undermining local people’s struggles against plantations. All large scale tree plantations impact heavily on most -and usually all- of the above. There is now more than sufficient documented evidence of those impacts in a large number of countries, ranging from South Africa and Swaziland to Brazil, Colombia, Chile, Ecuador, Uruguay, Spain, Ireland and others. Four years after having launched the FSC Plantations Review, nothing has changed. In spite of abundant documentation demonstrating the negative social and environmental impacts of plantations, there are currently at least 8.5 million hectares of plantations already certified, as well as an unknown area within the 37.7 million hectares grouped under the category “semi-natural and mixed plantation and natural forest”, which hides a large number of plantations. The time has now arrived for FSC members -particularly from the social and environmental chambers- to take sides: to continue to allow business as usual, or to fight for change; to protect the interests of large pulp and timber corporations or the rights of local peoples and Nature; to carry on accepting that plantations are a “type of forest” or to agree that they have nothing in common with them; to greenwash a most harmful land-use, or to oppose social and environmental destruction. Further information on the destructive nature of industrial tree plantations is available onWRM’s website.